Small Talk - First impressions matter, are your vibes positive? You must be a member of the Helsinki Singles Group to attend this activity. Would you like to join this group? 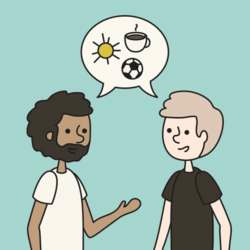 Small talk can be tricky and for expats and other international people who travel a lot, it is a great skill to have. First impressions do matter and you can also influence how people perceive you at first encounters. If you want to find out what people think about you after a quick small talk, join our event. We will have two people talking for 3min and then change to the next person until we have all talked to each other for 3min and written down for each person three adjectives that first come to your mind. 18. Protected content small talk – it is timed and I will tell people when to start talking to the next person until everyone has talked to everyone. Buy your own drinks/ snacks from the cafe before we start at 18.30. Please bring your own pen and paper! We will hand out a list of questions you can use if you want and a list of the attendees. You can write down the adjectives on each name, but the paper you bring is for your own feedback if you want to write it down.